Set during the moments preceding and the days following the Halifax Explosion in December 1917, A Blinding Light describes the events from several points of view in a society established on social class and rank, where bigotry, blame and racism blend together to motivate characters to act towards each other sometimes unfairly, and at others with the highest regard for human values. Livy and Will are of German descent living in Halifax during the Great War. Having lost their father in a sailing accident, the siblings embody polar opposites of their middle-class upbringing. While Livy has the maid fired for breaking a vase for which she is guilty, Will struggles outwardly to protect the integrity of the pilot being blamed for the series of events which led to the explosion that killed thousands. And throughout the novel, the Schneider family faces the racism of the city’s inhabitants who believe the explosion was a German plot. 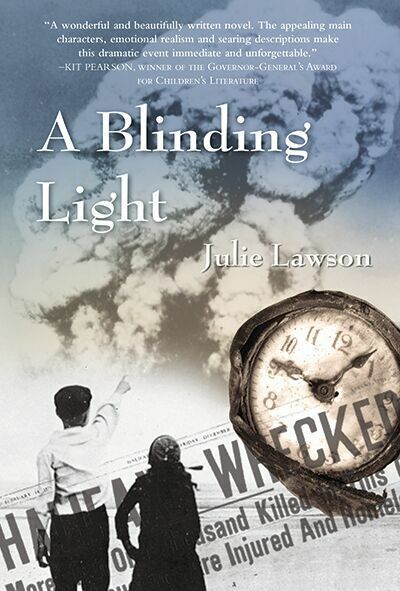 A Blinding Light was nominated for the Geoffrey Bilson Award for Historical Fiction in 2018. Classroom Connections: This is a timely novel which can apply to so many situations that children face locally and globally. Using a historical calamity to distance the reader in time, while exposing students to issues of fairness, racism, war and terrorism, resulting in ultimate justice for those wrongly targeted, A Blinding Light would make an excellent individual or class novel study to enhance the history curriculum in the class. Students who read this novel may be inspired to learn more about history and ultimately take lessons which they might apply to their own lives. This review is from Canadian Teacher Magazine’s Winter 2019 issue.